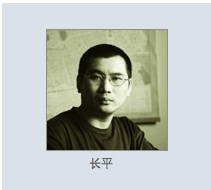 CMP is still trying to ascertain the exact nature of the pressure that came down on the well-known columnist and editor, who writes under the penname Chang Ping (长平). There is little doubt, however, that Zhang’s recent writings on the issue of Tibet and Chinese nationalism prompted Chinese Web users and other mainstream Chinese media to heap scorn and vitriol on Southern Metropolis Daily, the publisher of Nandu Weekly. While the actions forcing the move against Zhang are unfortunate, it is important to note that he has not been prevented from writing. Today’s editorial, while dealing more indirectly with the controversy over previous comments by “Chang Ping”, shows the newspaper’s determination to press for more rational and open discussion on the basis of such universal values as freedom of expression. 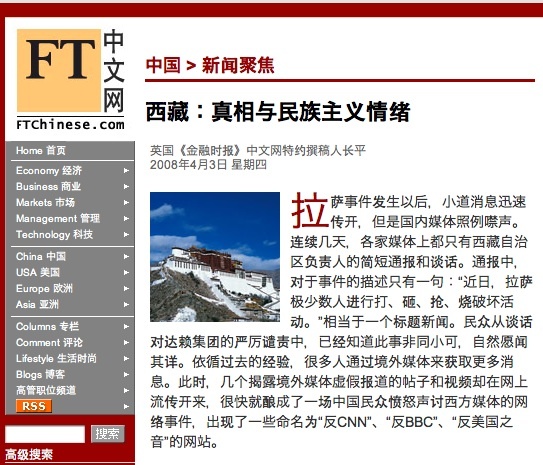 The controversy surrounding Chang Ping began back on April 4, when the columnist posted on his personal Weblog a piece entitled, “Where Does the Truth About Lhasa Come From?” The article also ran on the Chinese language edition of the British Financial Times under the title, “Tibet: Truth and Nationalist Sentiment.” [Find a full English translation at ESWN]. If we use nationalism as the weapon to resist the westerners, then how can we persuade the ethnic minorities to abandon their nationalism and join the mainstream nation-building? The Dаlai Lаma asked the Chinese government to reassess him, so what kind of person is he really? Apart from the official government position, will the media be permitted to discuss the matter freely and uncover more truths? [Translation by ESWN]. 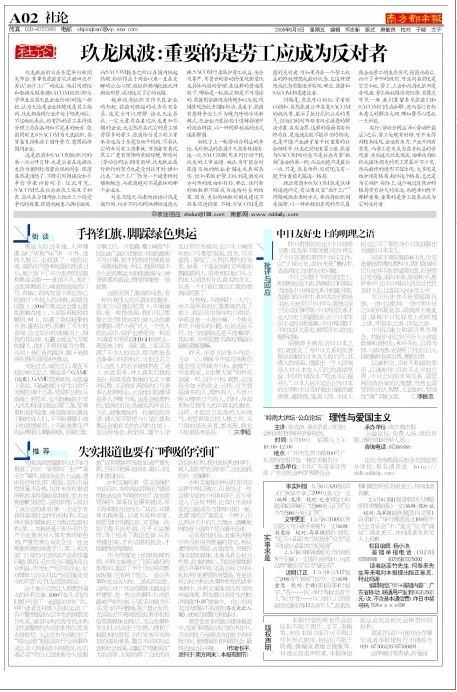 On April 11, Beijing Evening News – a commercial spin-off of the capital’s official Beijing Daily – ran an editorial by Wen Feng (文峰) attacking Chang Ping’s views in the April 3 essay. It was called, “Southern Metro’s Chang Ping and the Freedom to Rumor-monger.” [See Danwei.org’s “The Internet wages war on the liberal media”]. Chang Ping’s editorial today, “Even Reports with Errors Need a Bit of Breathing Room,” discusses the urgency of freedom of expression in China today by turning to a recent defamation case involving China Central Television in which the court’s decision harbors possible shades of the 1963 U.S. Supreme Court verdict in the New York Times Co. v. Sullivan case. The writer’s invocation of Justice Brennan’s famous words about the need to give media “breathing space” — that errors are inevitable in free debate, and even certain false statements must be protected if the freedoms of expression are to survive — reflects back on many important stories in China over the last two months, not least the question of the truth about unrest in Tibet. Chang Ping’s editorial follows in full. In March last year, China Central Television’s Weekly Quality Report (每周质量报告) (an investigative news program dealing with issues of consumer and product safety) reported on the case of a Hebei textile factory producing what it called “poisonous cloth” (毒毛巾). The factory in question took the case to court, arguing that while its cloth had been found substandard on inspection by relevant government authorities, it did not contain powerful carcinogens [as the program had alleged]. The company demanded CCTV apologize and pay damages. After hearing the case, the court dismissed the factory’s case on the following grounds: 1) While the company had a right to an objective assessment by the public, the media’s right to carry out watchdog reporting was protected under the law; 2) CCTV’s investigative program was based on the use of physically harmful dieing agents by some cloth manufacturers, posing a danger to public well-being; 3) Relevant government authorities had recently determined there were quality problems with the products in question; 4) Cloth safety was a matter of public interest, and manufacturers had an obligation to tolerate scrutiny by the media and the public. This case naturally recalls the famous [U.S.] case of New York Times Co. v. Sullivan. In March 1960 the New York Times ran a full-page political advertisement calling on readers to support the civil rights movement [led by Martin Luther King Jr]. The advertisement described actions taken against civil rights demonstrators [in Montgomery, Alabama], with some of the facts given inaccurately. Montgomery commissioner L.B. Sullivan brought a defamation case against the New York Times to defend his reputation and seek damages. Supreme Court Justice Brennan raised the standard of “actual malice,” placing the burden on the plaintiff in defamation cases involving public incidents or public figures to . . . prove that media showed actual malice or reckless disregard for the truth. In the end, the court ruled in favor of the New York Times. Additionally, media in practice are not scientists. If they are expected to disseminate information in a timely manner and at the same time ensure each and every detail is free of error, they would have no way of working. This would mean killing off watchdog journalism (舆论监督). Only when information is aired out do we have an opportunity to reveal error, and only in this way can we arrive at the truth. As a landmark decision in the history of journalism, the NYT v. Sullivan case established new internationally accepted principles and propelled a half-century of press development. The case established two important points. The first was the idea of matters of public interest (公共事件) and the public figure (公众人物). The second was the standard of actual malice (实际恶意). Both points have importance for media practice in China. For some matters of public interest information sources are tightly controlled and journalists find it difficult to carry out reporting. Demanding pure accuracy of every word translates to a prohibition against speaking at all. This is especially true in the age of new media, with tools like the Internet and SMS messaging. When public incidents happen, people demand information so that they can mitigate their fears and learn the facts. But as the exchange of inaccurate information is on the rise, the police, asking nothing of actual malice or the social consequences, mobilize against the crime of “disseminating rumors.” This undoubtedly inhibits citizens’ right to freedom of expression. In the hands of some, my support of this right has been twisted into the “freedom to rumor-monger” (造谣自由), and here I’m trying once again to explain myself. The NYT v. Sullivan case has not been established in Chinese law. But it has entered into the decision rendered by our courts in recent years as legal experts have introduced and promoted its principles. Several years ago, for example, the above arguments were outlined clearly in the decisions rendered by the courts in the libel case launched by sports star Fan Zhiyi (范志毅) against Oriental Sports Daily, and in the “poisonous cloth” case [I referred to as I began this editorial]. It should be pointed out that the CCTV case has not been widely affirmed on the Internet, but instead has met with much suspicion. This is because CCTV, as a state media organization, is invested with government authority. [This raises the question of whether] the core of the case is about media reporting on matters of public interest, or about government authority in a standoff with private interests. More importantly, in many cases concerning government authority and incidents [or matters] of public interest, not even a drop of the spirit of the Sullivan decision is evident. In the April 28 railway disaster, for example, a Web user from Shandong province was detained by police for five days for posting inaccurate information (exaggerating the number of dead). I hope that inaccurate information and false statements can enjoy greater breathing space in more news reports from local media, in more voices raising doubts about government authority, so that media can have an opportunity to correct inaccuracies and eventually achieve balance and dynamism.